Are You Set For Gears? No? Good, because we’ve got these plastic gear sets ready for you. You pick. The (20) piece pinion set includes gears from 4mm to 19mm, all meshing, and all with 1.9mm ID bores for 2mm shafts. In 0.5 modulus and very close to 48 pitch. 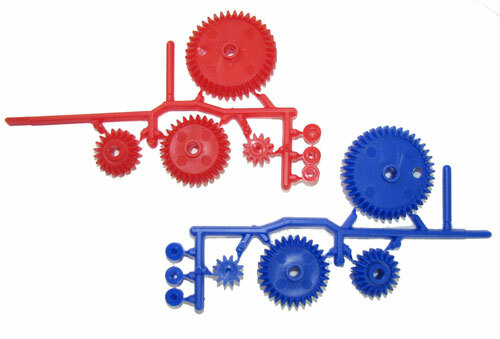 The (7) piece set is 16 pitch with a 20-degree pressure angle, and you’ll get red and blue gears from 3/4” to 2-1/2”, again all meshing. They’re 1/4” thick with a 3/16” bore, and come with a 1-1/2” handle to crank the hub on any gear. This rope hoist has drop-forged, zinc-plated eye-hooks and claims to be rated for a 2,000-lb working load, but we think that's a misprint. Great for easily hoisting lumber and pails of gravel, but leave your grand piano on the first floor, or hire the professionals. 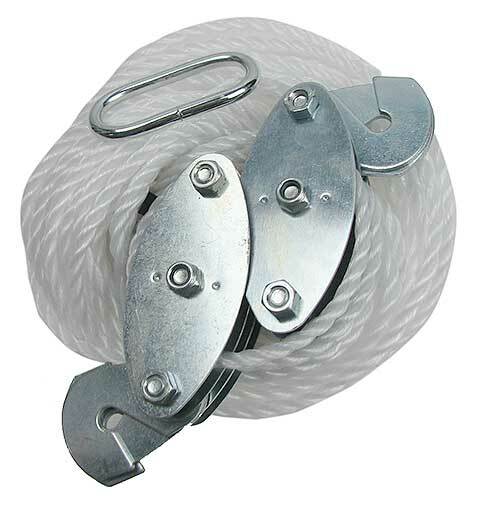 The eye-hooks are 2" x 1-3/8" x 1/4" ID, and the nylon triple pulleys provide a 7:1 lift ratio. 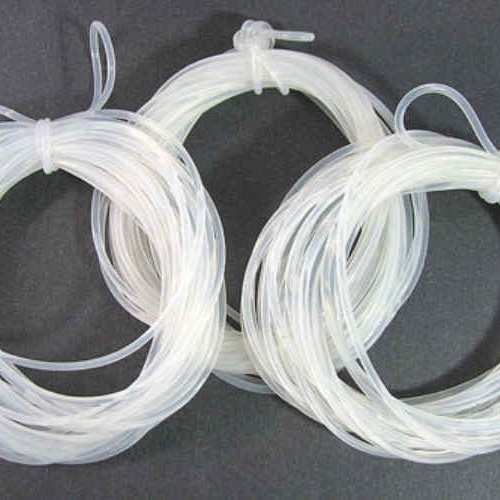 Includes (65) feet of 1/4” dia nylon rope. A nice pulley just ready to be combined into the block and tackle you need for tiny jobs, like trimming your bonsai trees or hauling your model boat out of the pond. Get this block with (1) sheave and rig up whatever you need. Each block has an aluminum frame about 3–1/2” long with “S” hooks on each end. The sheaves, or wheels are about 2” dia x 1/4” wide, with a “V” groove that looks perfect to handle 1/8” or smaller Venetian blind cord. These dudes are perfect for demonstrating mechanical advantage in the physics lab!! But not for heavy lifting. 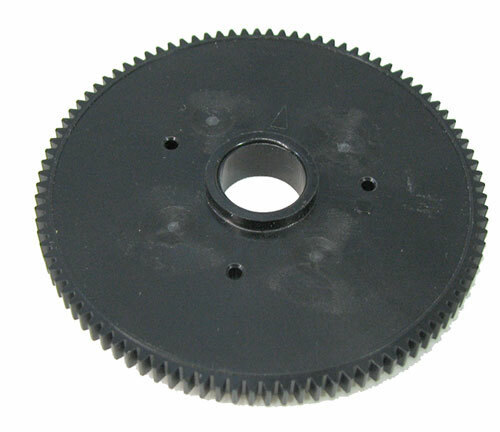 Little black plastic gear, 1-1/32" dia x 3/32" thick with (34) teeth, 32-pitch with a 14-1/2 degree pressure angle and a 3/8" long, 11/32" 9-tooth shaft, same pitch, with the teeth on the outer half. 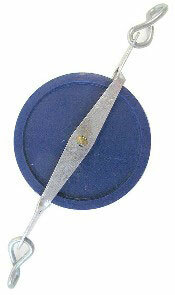 Has (3) equidistant 3/16" bores in the face, and a 5/32" bore on the shaft side, 3/32" on the face side. 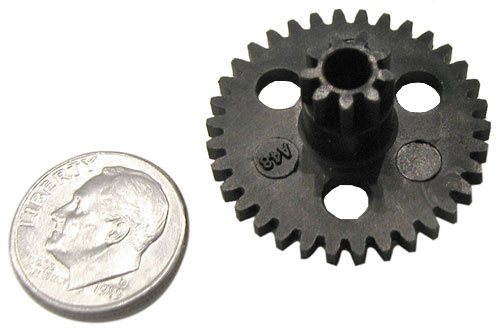 This black plastic gear is 3-1/16" dia with (96) teeth at 32 pitch, 20-degree pressure angle. Center has a 9/16" ID bore with a 3/4" dia x 1/8" bushing on both sides. One side also has (3) 3/32" ID x 1/8" standoffs along with a 3/16" tooth along one edge. Source and function are unknown but you'll think of something. These translucent silicone O-rings are 1/8" thick and measure 3-1/2" dia. Nice belts for science-project motors and even nicer for your slingshot needs. Crafters will see jewelry material that the metal-detectors won't care about. You pick from our nylon gear collection. The 30-tooth gear is 1" dia, 32 pitch, with a 20-degree pressure angle. Measures 3/32" thick on the face with a 3/32" bore on that side and an 11/32" dia x 3/8" long 9-tooth shaft with the same pitch/pressure. 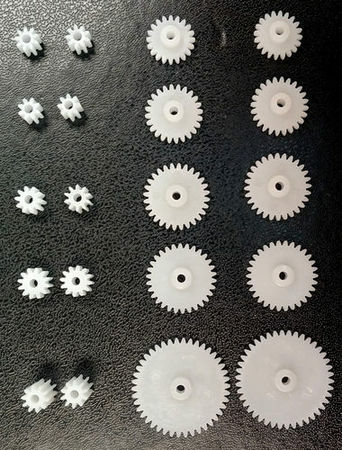 The 32-tooth gear is 1-1/16" dia, 32 pitch and 20-degree pressure angle (so it'll mesh with the 30-tooth). Measures 3/32" thick on its face with a 1/4" bore and a 15/32" dia x 17/32" long 13-tooth shaft with the same pitch/pressure. 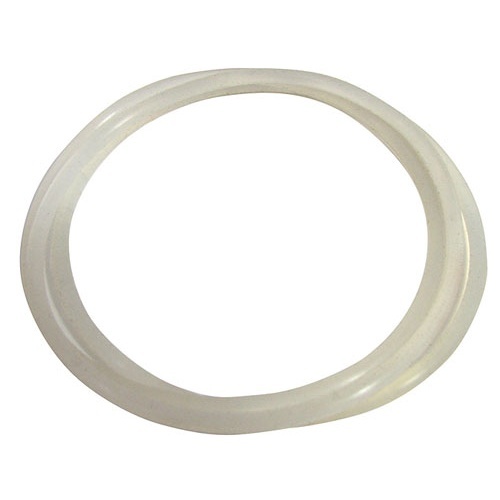 These translucent silicone O-rings are 3/32" thick and measure 4" dia. Nice belts for science-project motors and even nicer for our slingshot needs. Crafters will see jewelry material that the metal-detectors won't care about. 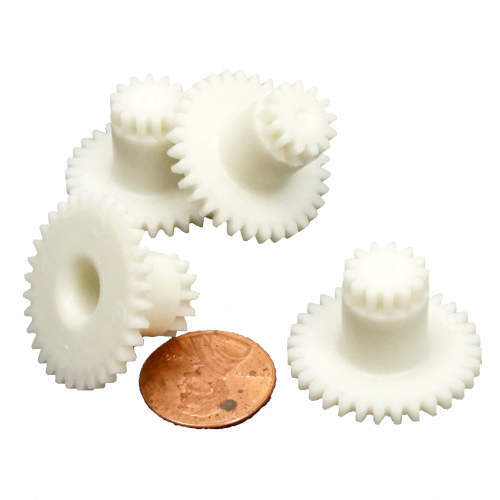 WHITE SILICONE BELTS 4" X 3/32"
This gray plastic gear is 1-13/16" dia x 3/32" with (56) teeth, 32-pitch, and a 14-1/2° pressure angle with a 3/8" long x 19/32" OD x 3/8" ID bore ready for a keyed shaft. Has (2) 1/4" bores on the face. 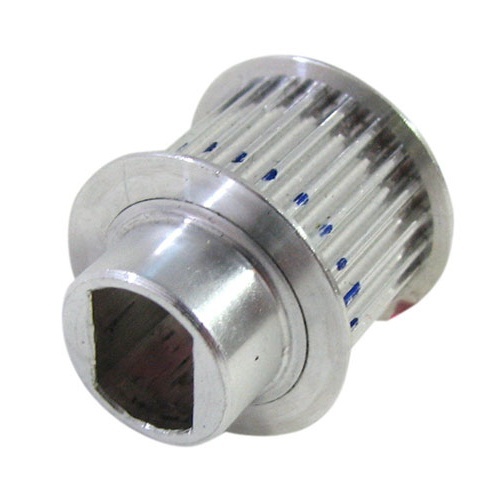 This small 24-tooth pulley is 1-1/16" long with 5/16" of that being a 5/8" dia shaft with a 1/2" x 3/8" flattened bore. 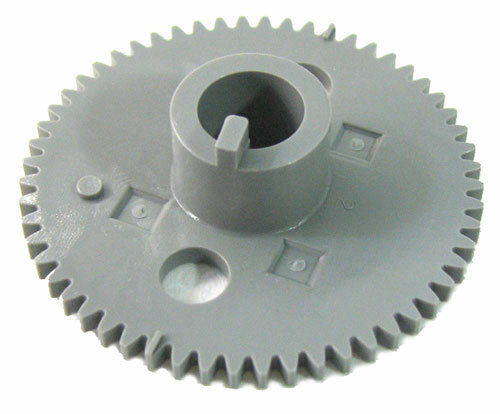 The pulley portion is 1" OD x 7/8" ID. In shiny silver aluminum. Or gear down-for the science fair or for any number of hobby projects. 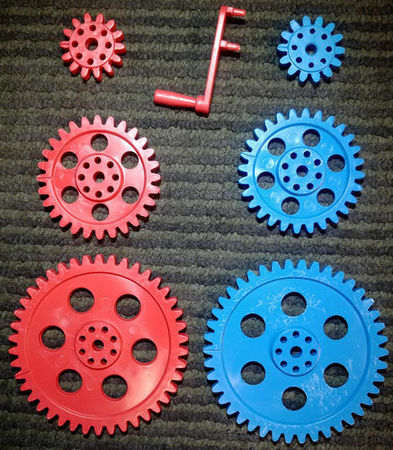 This hard-to-find set of (3) combination spur/beveled gears-for when you want gears set either straight or at 90° to one another-also has one small spur gear, plus three bushings. All in red, green, or blue plastic (we'll pick). The combo-beveled gears are 1-5/8", 1-1/4" and 27/32" dia with 3/16" bores to accept the bushings, which are 3/16" OD, 3/32" ID. The straight gear is 17/32" dia with a 1/16" half-bore. All are 24 pitch.